The Bone node is one of the main node used to build a deformation rig. Each Bone node consists of a bone and an articulation. Chaining Bone nodes will create a skeleton chain for your character. The Rigging tool can be used to create and connect those nodes automatically—see About Chain Creation. 2D Path When this option is enabled, the X and Y axis parameters are controlled by the same 2D path function. 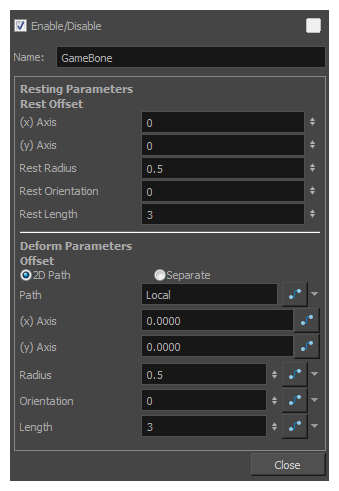 Separate When this option is enabled, the X and Y axis parameters are individual from each other. Path When using a 2D Path, this field displays the name of the function curve. (x) Axis This is the bone X-axis (horizontal) coordinates for the animation position. This parameter can be linked to a function curve to be animated over time. (y) Axis This is the bone Y-axis (vertical) coordinates for the animation position. This parameter can be linked to a function curve to be animated over time. Radius This is the articulation's radius value (articulation size) for the animation position. This parameter can be linked to a function curve to be animated over time. Orientation This is the bone's orientation angle for the animation position. This parameter can be linked to a function curve to be animated over time. Length This is the bone's length for the animation position. This parameter can be linked to a function curve to be animated over time.